Do you have nostalgic memories of running around the school yard, chasing after friends? Well, it looks like kids from Gold Ridge Elementary school in Folsom, California won’t be sharing those experiences. On a Friday in March, Principal David Frankel sent a message to parents stating that “students were instructed that physical contact during tag games, touch football, etc. were not allowed on the yard.” The ban on tag and other games involving physical contact raises a very important question. While the question is a complicated one, banning tag does seem a bit extreme. Gold Ridge Elementary is not the first school to take such drastic steps. In 2015, public schools on Mercer Island, Washington banned tag as well, with a “hands off” policy. Parents took to social media to protest the new rules. Mother Melissa Neher started the facebook page “Support Tag At Recess”, which boasted over 400 members at its height. In the case of Mercer Island, the school district quickly reinstated tag at recess, under pressure from many parents. What is so horrible about tag? If you remember playing as a child, you know that kids chase each other around, with one person who is “it” trying to catch the other children. Some educators feel that the physical contact involved might be inappropriate for children, or that tagging can easily evolve into pushing and other more violent forms of contact. While it may be true that sometimes even simple playground games can get a little rough, banning tag seems a bit over the top. 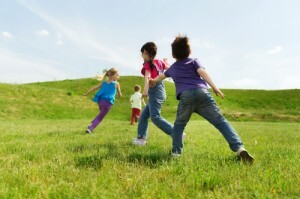 When it comes down to it, tag really encourages kids to run around and get out some energy. With all of the time kids spend staring at screens, including tablets and smart-boards in the classroom, recess is such a great opportunity to encourage active play. Many of the most popular sports involve some sort of physical contact, because that is part of what makes games fun and competitive. Banning any games which involve even light touching discourages kids from being active at recess, and sends a message that we don’t trust them to learn the difference between friendly touch in the context of a game, and violence or other forms of unwanted touch. What is great about tag, unlike many classic sports, is that there is no limitation on how many kids can participate. That makes it a rare game in which everyone can be included. How can educators take away such a wonderful opportunity for an unlimited amount of students to play, get active and have fun together? Of course children need to learn when and how touch is appropriate, and when it is not. But rather than banning a beloved game in fear of a blurry line, educators should use such games as an opportunity to open up the conversation about the line between play, aggression and unwanted touch. I think we can all agree that that is a conversation worth having. Educators, Take Advantage of Your Summer! © 2019 A Blog for Principals and Teachers – School Matters. All Rights Reserved.